Sorry it’s so dark! But compare my map with the one depicted in this CBS Early Show segment. I know it seems crazy to think that these messages in bottles travel in a big circle around the Atlantic, but it really is the most likely explanation. 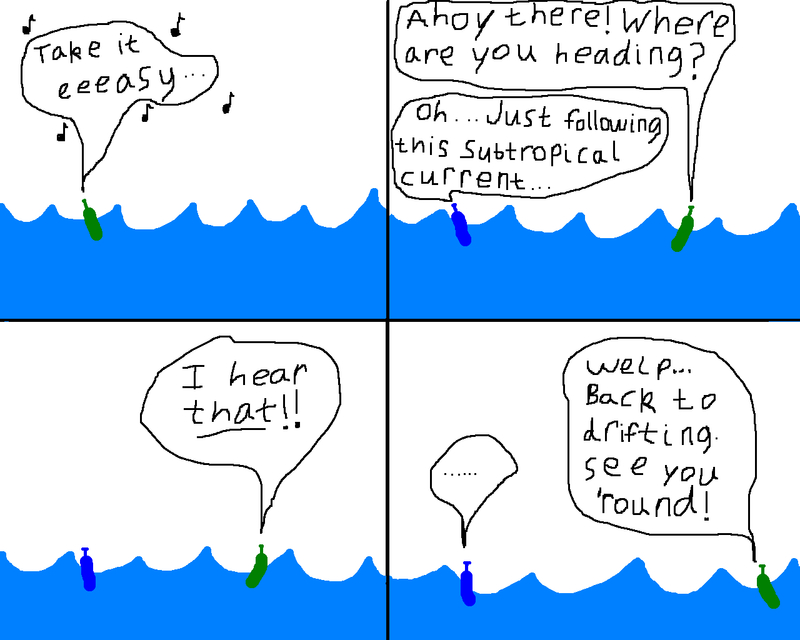 You can google around and find better maps of the currents–but they all say basically the same thing: stuff in the Atlantic circles clockwise. Heck, ships have a hard time swimming against the Gulf Stream! Imagine a wee little bottle trying to fight that force! If you ask me, it is much more likely that bottles go with the flow. Hello from a beach lover in NJ! What a fun hobby. I briefly considered joining you, but I don’t want to touch a lot of the stuff that I see washed up-you’re a brave soul. How exciting~ You are quickly becoming an East Coast celebrity. We are a local New Hampshire station doing a story on this message in a bottle and want to use the pictures of tehb ottle and message that you have posted. Can we please? We of course will courtesy you. The station is WMUR Channel 9. Can we please have your permission to use the pictures of the bottle and the message in our story tonight? Channel 9 out of New Hampshire?